Genetics is the branch of biology concerned with the science of heredity. The term heredity refers to the way in which specific characteristics are transmitted from one generation to the next. For example, we know that a tall mother and a tall father tend to have children that are tall. Geneticists (scientists who study genetics) are interested in finding out two things about this observation. First, what is there in the cells of a person's body that directs the body to become tall rather than short. Second, how are the directions for "tallness" transmitted from parent to offspring, from one generation to the next? Humans have known about hereditary characteristics for thousands of years. That knowledge has been used for the improvement of domestic plants and animals. Until the late nineteenth century, however, that knowledge had been gained by trial-and-error experiments. The modern science of genetics began with the pioneering work of the Austrian monk and botanist Gregor Mendel (1822–1884). DNA (deoxyribonucleic acid): Molecules that make up chromosomes and on which genes are located. Dominant gene: The state or genetic trait that will always express itself when present as part of a pair of genes in a chromosome. Heredity: The transmission of characteristics from parents to offspring. Nucleotide: A group of atoms present in a DNA molecule. Recessive gene: The state or genetic trait that can express itself only when two genes, one from both parents, are present and act as a kind of code for creating the trait, but will not express itself when paired with a dominant gene. Triad: Also known as codon; group of three nucleotides that carries a specific message for a cell. Mendel studied the genetic characteristics of pea plants. He was interested in finding out how certain traits, such as flower color and plant height, were passed on from generation to generation. During his lifetime, he studied dozens of generations of plants of all sizes, shapes, and colors. As a result of his research, Mendel was able to state a few basic laws describing the way genetic traits are inherited. He also came to the conclusion that there must be a specific biological unit responsible for the transmission of genetic traits. He called that unit a factor. Mendel's "factors" were later given the name of genes. Without question, Mendel was the father of the modern science of genetics. One of the great ironies of history, however, was that his discoveries were lost for more than three decades. Then, in the early 1900s, Mendel's research was rediscovered almost simultaneously by three different biologists, the Dutch botanist Hugo de Vries (1848–1935), the German botanist Karl F. J. Correns (1864–1933), and the Austrian botanist Erich Tschermak von Seysenegg (1871–1962). Although interest in genetics grew rapidly after 1900, a fundamental problem remained. Geneticists based all of their laws, theories, and experiments on the concept of the gene. But no one had any idea as to what was a gene. It seemed clear that the gene was probably some kind of chemical compound, or some combination of compounds. But no one had been able to determine exactly what kind of compound or compounds it was. The answer to that question came in 1953. The American biologist James Watson (1928– ) and the English chemist Francis Crick (1916– ) collaborated to discover that a gene was a section of a very large and complex molecule found in the nuclei of all cells, the deoxyribonucleic acid (DNA) molecule. Imagine a very long chain of beads strung together to form a strand containing hundreds of thousands of beads. The strand contains beads of only four colors: red, yellow, blue, and green. That strand of beads can be compared to half of a DNA molecule. The other half of the molecule is a second strand almost identical to the first strand. Watson and Crick showed that the sequence in which various colors of beads occur is significant. A DNA molecule in which the beads are arranged in the sequence blue-yellow-yellow-red-red-blue-blue-blue-, and so on, has meaning for a cell. The sequence tells the "chemical machinery" of the cell to make a certain kind of protein, such as the protein responsible for red hair or blue eyes. Another sequence of colors, for example, red-red-yellow-green-blue-green-red-, and so on, might be the "code" for making blonde hair or green eyes. The dots at the end of the chain indicate that the chain actually goes on much, much longer. Watson and Crick said that each set of three nucleotides—they called them triads or codons—carried a specific message that cells could understand. Those messages told a cell to "make red hair," or "make blue eyes," or "help a person to grow tall," or "give a person musical talent," or any one of thousands of other traits that each human possesses. 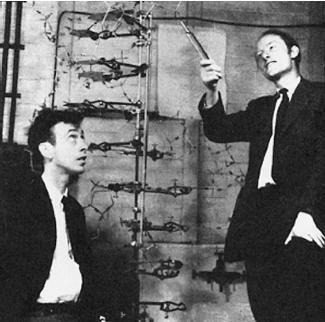 Francis Crick (right) and James Watson display their model of DNA's structure. This discovery answered the first question that geneticists had about heredity: how cells know which traits they are "supposed" to make and what functions they are "supposed" to carry out. The same discovery also answered the second question puzzling geneticists: how do these traits get passed down from generation to generation? The answer to that question is that DNA molecules have the ability to make copies of themselves. When a cell divides (reproduces), so do the DNA molecules it contains. In most cases, two exactly identical molecules are produced from a single parent molecule. When an egg cell (female reproductive cell) and a sperm cell (male reproductive cell) unite during fertilization, each cell provides DNA to the fertilized egg. The DNA from both parents combines to form DNA for the offspring. Whatever nucleotide sequences the mother and father had in their own cells, they pass on to their child. One fundamental question remains in the above example: suppose that a child is born to a father with red hair and a mother with blonde hair. What color hair will the child have? Mendel worked with this question long before Watson and Crick discovered the nature of DNA. He found that for any one genetic trait, there were always two possible conditions. A flower might be red or white; a plant might be tall or short; a pea pod might be smooth or wrinkled; and so on. Mendel also discovered that one of these two conditions was more likely to "win out" over the other. He called the "winner" the dominant trait and the loser the recessive trait. If a pea plant inherits a "tall" gene for height from both parent plants, the offspring is most like to be tall. If the pea plants inherits a "short" gene for height from both parent plants, the offspring is most likely to be short. But if the pea plant inherits a "tall" gene from one parent and a "short" gene from the second parent, the offspring is most likely to be tall. An important part of Mendel's work was finding out what the mathematical chances of various kinds of combinations might be. For example, he showed how to calculate the probabilities that would result when a "tall" parent pea plant was crossed with a "short" parent pea plant in the first, second, and succeeding generations. One can apply the principles of genetics in a great many situations without knowing anything about the structure of DNA molecules. However, the Watson-Crick discovery made possible a revolutionary change in the basic nature of genetics. As long as scientists had no idea as to what a gene was, there was not much they could do to make changes in the genes of a plant, animal, or human. But Watson and Crick showed that genes are nothing other than chemical compounds. If someone can make changes in chemical compounds in a laboratory, that person can also make changes in a DNA molecule. The problems faced are a good deal more difficult since DNA molecules are far more complex than most molecules that chemists work with. But the basic principles involved are the same. Scientists are exploring a variety of ways in which genes can be modified to produce cells that can do things they could not do before. For example, it is possible to create the gene for the hormone (chemical messenger) known as insulin in a chemical laboratory. The work is fairly difficult, but by no means impossible. It simply requires that the correct atoms be assembled in the correct sequence. That artificial gene can then be inserted into the DNA of other organisms, such as bacteria. When the artificial gene becomes part of the bacterial DNA, it begins to function just like all the other genes in the bacteria's DNA. The bacteria begins to function as an "insulin factory," making a vitally important compound that it could never make before. One of the most exciting recent developments in genetics is the initiation of the Human Genome Project, which officially began on October 1, 1990. This project is designed to provide a complete genetic road map outlining the location and function of the approximately 50,000 genes in human deoxyribonucleic acid (DNA) and to determine the sequences of the 3,000,000,000 base pairs that make up human DNA. As a result, genetic researchers will have easy access to specific genes to study how the human body works and to develop therapies for diseases. Gene maps for other species of animals also are being developed. There appears to be virtually no technical limit to the things that scientists can do with genes. But with the promise of genetic research, many ethical and philosophical questions arise. One question is, of course, whether there are social or ethical limits to the kinds of changes scientists ought to be allowed to make in the genes of plants, animals, and humans. With research focusing on the ability to manipulate genes, there is the fear that the results will not always be beneficial. For the most part, the benefits for medicine and agriculture seem to far outweigh the possible abuses, and genetic research continues. I am currently doing an assignment at school on genetics through the use of a reebop experiment. I foudn this article exteemly helpful however i was wondering if you knew what causes genetic variation between two chilredn of the same parent. thanks. I HAVE FIND MANY SOLUTION OF MY PROBLEM WHICH I FACED DURING MY GENETIC"S ASSIGNMENT. I'm doing a project in science about the history of genetics and i was wondering do you know were i can find some more useful information? The topics in this article are pertinent to the subject at hand. They are absolutely useful to anyone who needs a refresher course / quickly to maintain the pace in Grad School sometimes the information in the textbook can be vague, but nevertheless, this article can put you on track with the fundamentals of genetics. Whats so great about this page is that, its good for plant, humans, etc. im doing my assignment in gen. psychology!! this article helped me a lot!!! 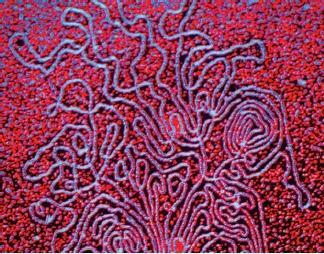 DNA IS IN ALL CELLS, HOW IS IT POSSIBLE? DNA PRESENT IN GENE OR CHROMOSOME? I love the image you have of the human body and strand of DNA. May I please have permission to print a copy for my students' science notebook covers? This was helpful. I have a project for school. And I can't type less than 50 letters so bye.